This is Temple Back East from Temple Back bridge heading for Temple Meads station from Old Market roundabout. 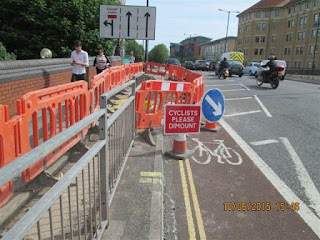 It could be a mis-spelled "cyclists dismount" sign, except there's no reason to dismount, not when there's the hatching to the left. Dimounting, then, must mean something else. Our theory: riding a saddle designed to entertain your entertainable bits while on a ride. It's been mandatory since 2011 for cars to have daylight running lights ("DRLs"). Is this a good thing? Or just it just up the arms race between motorcyclists, cars, pedestrians and cyclists? For a change, there's actually some research on this topic, in the form of a 2008 study from the US government, "The Effectiveness of Daytime Running Lights For Passenger Vehicles". Bear in mind that the sample set of this study is of course US drivers, who are a lot more common than US ones to drive round at night without lights on. DRLs partially mitigate for this inattentiveness —or it may amplify it if drivers don't notice they have their lights off, on account of the DRLs illuminating in front of them. The analysis evaluates the effects of daytime running lights (DRLs) against three types of target crashes: (1) two-passenger- vehicle crashes excluding rear-end crashes, (2) single-passenger-vehicle to pedestrians/cyclists crashes, and (3) single- passenger-vehicle to motorcycle crashes. Each crash type was examined at three crash severity levels – fatal, injury, and all severity. The basic approach is a control-comparison analysis of real-world crash involvements for DRL-equipped vehicles and non-DRL vehicles. Ratio of odds ratios were used to derive the DRL effects. A 95-percent confidence interval was used to infer statistically significant conclusions. The Fatality Analysis Reporting System and the State Data System were the crash data sources used for this analysis. The analysis found that DRLs have no statistically significant overall effects on the three target crashes. When combining these three target crashes into one target crash, the DRL effects were also not statistically significant. When examined separately for passenger cars and light trucks/vans (LTVs), DRLs in LTVs significantly reduced LTVs’ involvements in the target two-vehicle crashes by 5.7 percent. However, the remaining DRL effects on these three target crashes were not statistically significant. Although not statistically significant, DRLs might have unintended consequences for pedestrians and motorcyclists. Particularly, the estimated negative effects for LTVs were relatively large and cannot be completely ignored. The final two sentences are the highlight: from the survey done 8 years ago, it appears that daylight running lights may make it more dangerous for pedestrians and cyclists. And what are LTVs? That's pickups and SUVs. The study was conducted by looking at crash statistics and seeing if those vehicles with DRLs were in crashes more or less. It wasn't a randomized sample (give people cars with DRLs on or off), which could skew the numbers (drivers of volvos are safer than drivers of ford mustangs, etc, older cars have worse brakes, etc.). Furthermore, as whether full lights were on or off wasn't recorded, the impact of DRLs at dawn or dusk can't be established. based on the combined PC (Passenger Car) and LTV (Pickups and SUVs) results, DRLs seemed to have no overall effect on daytime target crashes. See that? No statistically significant affects whatsoever. They are the helmets of cars: useless, yet designed to make you feel bad for not having them. For all crashes, again the estimates were not statistically significant. However, based on the combined State data, DRL effects for both PCs and LTVs were negative. Overall, DRLs seemed to increase Single-PV-to-PED/CYC crashes by 5.6 percent. There you have it then. A feature which does nothing for overall safety rates, but which actually appears to increase risk for pedestrians and cyclists. DRLs seemed to increase daytime Single-PV- to-Motorcycle crashes by 1.2 and 17.3 percent for PCs and LTVs, respectively. Overall, DRLs seemed to increase daytime Single-PV-to-Motorcycle crashes by 5.0 percent. None of these effects were statistically significant. There you go then: daylight running lights appear to slightly increase the risk to vulnerable road users, while delivering no benefit whatsoever for the occupants of the car themselves. Given this data: they do nothing for cars and endanger others, why offer it, and then why mandate it? Offering it in cars could be assigned to a belief that it does make a difference (possibly even some unpublished data that it does). Or, more cynically, because if possible purchasers ares somehow convinced that DRLs improve their safety, then they would buy that particular model of cars, possibly paying a premium. If you are a car manufacturer who discovered that spending £1 to ensure your car lights stayed on all the time could earn you £100 —you'd do it. But why mandate it? That would remove all differentiation between vendors? Politicians also mistakenly believe there is a safety benefit, and that by mandating it they can improve safety. Politicians don't care where it is beneficial or not, they just want to be seen to be doing something that they can take credit for and doesn't cost much. It is used as an excuse to avoid fundamental changes in road safety. Here the car manufacturers would be lobbying politicians. Unlike other features (ABS, Airbags) which actually cost money, DRLs are cheap to roll out. You'd push for them if the alternatives cost money. Whatever the reason, its motorcyclists, pedestrians and cyclists who appear to lose out. (*) There is also the theory that there is some other work that through some controlled A/B test shows that it does make a difference, and furthermore politicians have read and understood the details. This hypothesis is considered significantly unlikely.